Tigers are the largest cats in the world. However, the size of each particular subspecies depends on several factors like habitat, climate, food, prey and so on. Tigers have a body design that allows them to move along gracefully. They are also incredibly fast when it comes to hunting their prey or getting themselves out of the way of danger. 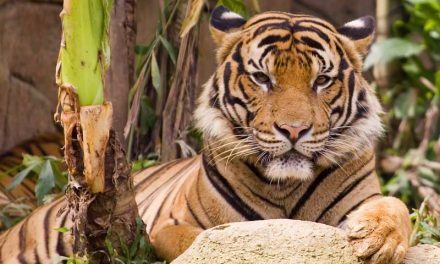 A full grown tiger can be up to 11 feet in length and weigh as much as 670 pounds. They have a very muscular build too which helps them to take down prey that is many types heavier than they are. The females are smaller than the males for all of the different species of tigers, which is an indicator of sexual dimorphism in this species. Tigers are vertebrates; this means that they have a backbone that supports their body and starts at the skull and ends at the tip of the tail, acting as a flexible central support for the rib cage and limbs. The skeleton is composed of bones, therefore, attached by joints. In the end, more than 200 bones build an active and flexible structure that allows the performance of more than 600 muscles. They have a big skull with a rounded shape and powerful jaws. In fact, the lower jaw is almost straight. They have seven vertebrae in the neck, seven lumbar vertebrae, 13 thoracic vertebrae and three sacral vertebrae. Its clavicle is small, which favors the execution of larger movements. 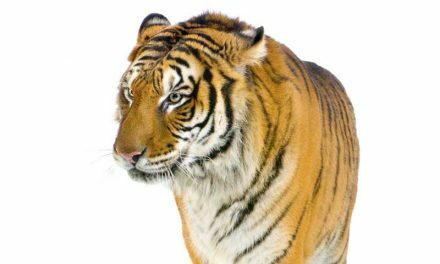 Each bone in the back of a tiger plays an essential role while moving and even in their behavior. For example, when an individual opens their jaws to growl, wag their tails, or crouches in wait for the ideal moment to jump, particular sets of muscles pull at several specific bones. The whole skeleton constitutes about 20 percent of the total weight of a tiger. External anatomy of an adult tiger. They have a broad, short head over a rather thick neck. Despite being somewhat robust, they are tremendously agile when hunting and have no problem swimming or climbing. 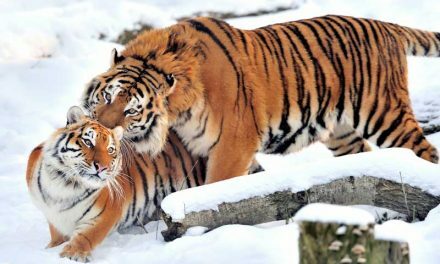 The most striking external characteristic of tigers, in addition to his large fangs, is perhaps its beautiful orange or golden fur with dark vertical stripes. This pattern of stripes, evident in their coat, is unique in each specimen, and the background coloration varies according to the subspecies, that is, it may be lighter or darker orange, and the stripes may appear broader or narrower. For example, tigers located in Southeast Asia tend to show more streaks than other tigers. Also, they have a white circle behind the ears, which are believed to work as elements to express aggression or as fake eyes to predators. Their stripe pattern is similar to the way our fingerprints makes each one of us unique; This is how researchers can identify them during observation in a natural habitat setting. The way how their stripes are in the coat though serves a purpose that is well beyond basic identification. It is the way in which they can successfully camouflage in the wild from predators, and it is also one of the most useful tools they have for sneaking up on prey. 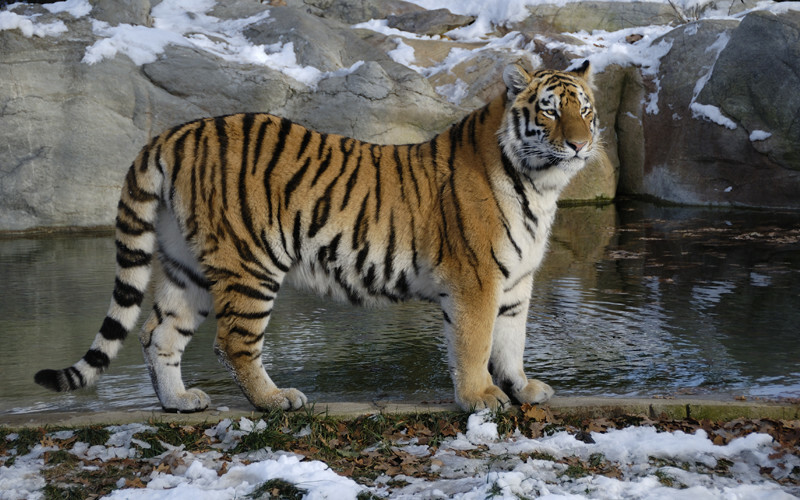 Not all Tigers have a background orange color, for example, the white tigers that feature black stripes and blue eyes are the result of a gene mutation in the coloring, and it rarely occurs in the wild. However, due to their popularity, they are intentionally bred in some zoos. The existence of white tigers implies the lack of a recessive gene that gives them a coat of very clear or almost whitish background, often considered white. 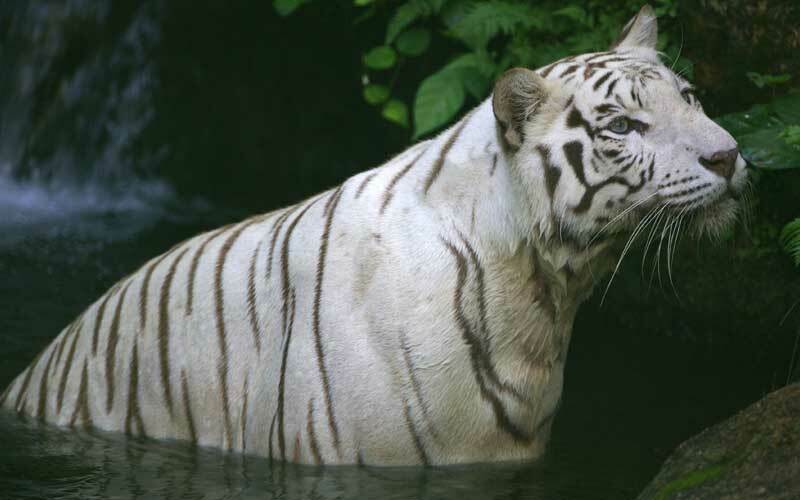 The White tigers are not albino since they retain their dark stripes and their eyes present a blue color and not pink or red, as would be expected in an albino specimen. The tail, which measures about 1 meter in length, is slightly thick with fringes. Its function is to maintain the balance of the body, especially when an individual turns abruptly. The eyes contain a circular pupil, and the iris is yellow except for the white specimens. Numerous papillae cover the tongue, resulting in a rough texture to the touch. Both the legs and the shoulder regions of tigers are extremely muscular and powerful, which gives them the ability to subdue various types of prey instantly. They also have paws which help them to climb and to grasp things being the ones of males larger than those of the females. Interestingly, they have the hind legs longer than the front legs which also help to increase the jumping ability. In the latter they have long retractable claws attached to the five fingers; The back legs only have four fingers. The four legs have pads similar to those of domestic cats, which allow them to stalk their prey silently. White tigers have pink pads. Their claws are extremely sharp. From the five claws they have on each front foot, the first one never touches the ground. Each of these claws has a cover so that they don’t get exposed and worn out when they don’t need to use them. They sometimes scratch their claws against the trees probably to keep them sharp. They have heterodont dentition where the long canines of 2.5 to 3 inches in length stand out. They have pressure-sensitive nerves which are ideal to give the fatal bite in the vertebrae of their prey. In total, their mouth has 30 dental pieces. Denture of an adult tiger. The ear is the sharpest and best-developed sense of Tigers and plays an important part during their hunting activities. In general, cats have better capabilities than humans to perceive acute sounds, up to 60 kHz. 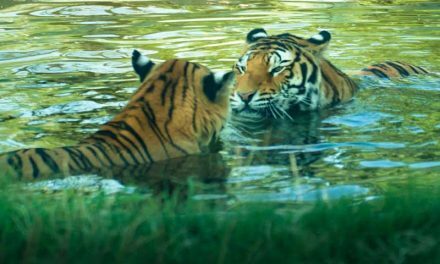 Tigers have a maximum sensitivity of 300-500 Hz and can hear infrasounds that a person can not listen. Another significant advantage of Tigers is their eyesight. They can see just as well as humans during the day. However, at night their capacity is six times better than ours making much easier to them sneak up on their prey. Their vision is binocular because of the position of the eyes on each side of the head. This feature facilitates the calculation of distances to their prey. They have more rod cells than cone cells; This means that their vision in the dark is excellent and useful for detecting movements. Like other animals, it has behind the retina a structure called tapetum lucidum that amplifies light signals and consequently improves the night vision. In contrast to the ear, their sense of smell is not very sharp, so it does not play a significant role in hunting. However, it is useful for detecting odorous signs from other tigers. They have a modest amount of olfactory cells in the nose and an olfactory bulb in the brain. Within their oral cavity, they have only a few hundred taste buds that are few compared to the thousands present in the tongue of a human, but some think that they can perceive salty, acid and bitter flavors. It is not sure that they can taste sweet flavors. Regarding their sense of touch, the skin or the vibrissae, commonly called whiskers, are the ways to perceive it. All Tigers have five types of vibrissae with sensory nerves to orient themselves, detect dangers and attack. Also, the face has sensitive neurons that detect changes in air pressure when an object pass. 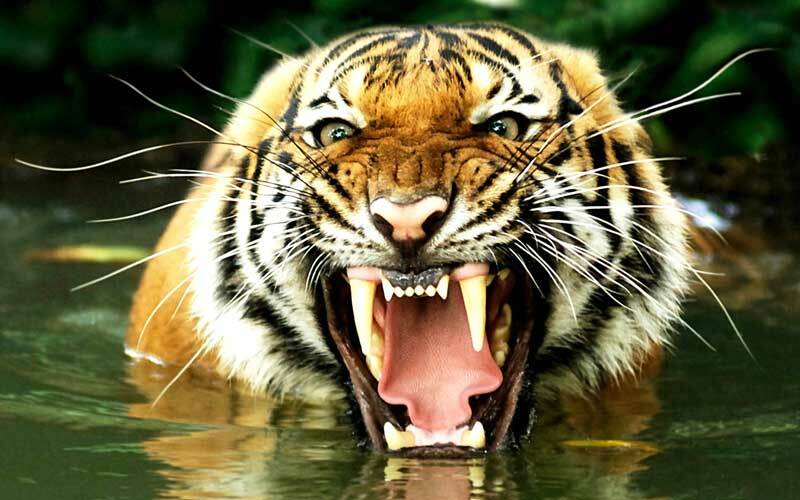 Bones of the Tiger: Protecting the Man-Eaters of Nepal. Hemanta Mishra. Rowman & Littlefield.